Why Mezzanine Goods Lifts Are A Good Investment? Mezzanine Goods Lifts are a good investment for any business that needs to move large numbers of goods to different levels. They reduce the need to manually handle goods which is beneficial for staff health and wellbeing. Access to mezzanine goods lifts is either by ramp or on level ground by sinking the base of the lift into a pit. Pallets and other goods can be loaded onto the lift using forklift trucks which eliminates the need for manual handling. The goods lifts are easy to install as they are self-supporting structures which connect to each floor level. All mezzanine goods lifts are built to customer specifications and comply with essential safety requirements of machinery safety regulations. There are safety gates and call buttons at each level ensuring a smooth elevation to each level. This doesn’t only reduce workplace injuries it also increases the rate at which goods are prepared for delivery. Injuries in the workplace are costly for businesses but even more so for the injured party. Injuries may result in workers being unable to continue working due to the resulting disability. Those who are able to return to work may spend a lot of time in recovery before they return to work. This requires employers to go through the cost of recruiting and training temporary employees. There is also the cost of compensation claims to include in the total costs incurred. The Health and Safety At Work Regulations 1999 states that all employers must conduct thorough risk assessments to eliminate or reduce risks. Businesses with over five employees must record the main findings of the risk assessment. (Source: ati.org.uk) The Manual Handling Operations Regulations 1992 looks at reducing the amount of manual handling required in industries. It states, ‘mechanise tasks where they cannot be avoided by the use of trolleys, barrows, lifts or hoists’. A mezzanine goods lift fulfils this requirement and maintains the wellbeing of the workforce. 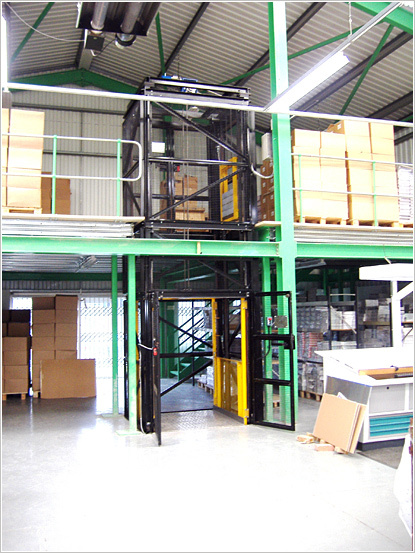 Challenger mezzanine goods lifts are built to the specific requirements of each individual customer. Each lift comes with a self-standing structure which attaches to each floor. Safety features include; slack rope switch, instantaneous safety gear, retiring cams, interlocked collapsible gate, journey timer, stop switches, pit props and enclosed lift car roof. All of Challenger’s Mezzanine Goods Lifts comply with essential safety requirements of machinery regulations. This ensures the safety of your workforce and reduces the costs relating to injury which makes purchasing a mezzanine goods lift an excellent financial investment. If you would like to find out more about Challenger Mezzanine goods lifts contact us and we would be happy to discuss your options.